One of the things I love about my “job” as a food writer is that people email me all the time with questions, mistaking me for some kind of expert. Where do you eat when you’re in Nashville? They ask. Or Can you recommend a good food mill? I see you have marble countertops, do you worry about stains? I plan to make your Vongole for friends next week, what should I serve with it? The speediness of my response to these emails is in direct proportion to my knowledge of the topic. If I know the answer or have a strong opinion about something, I will usually write back right away. If not…well maybe some of you out there are still waiting for replies from 2013. (Ugh, sorry.) You’d think by now, after two decades working in and around the food world, that I wouldn’t be stumped quite as often as I am. You’d think that after writing four cookbooks, I’d know the exact teaspoon measurement of “juice from a half a lime” or that I wouldn’t have to look up the correct spelling of chili with an ‘i’ and chile with an “e.” Or that I would know how long that pasta/sauce/casserole lasts in the freezer. You’d also think I’d have an arsenal of brand loyalties — that I’d always buy the same grainy mustard or the same barbecue sauce or the same tahini. I can’t believe how many different brands of tahini I’ve bought over the years. While the rest of the internet was falling in love with the ingredient over the past decade, I kept stalling out on my enthusiasm for it. All the jars I’d bring home seemed to have strange aftertastes or too-thick consistencies. My homemade hummus, while usually better than store-bought, still seemed to be not quite reaching its full potential. It’s not like this kept me up at night or anything, but I will say that ever since Phoebe started only selectively eating dairy, I’ve felt a new urgency to find a go-to, especially since tahini lends a creaminess to dressings and dishes that you can only usually get from (now verboten) milk or butter. So I finally did what you guys do — I asked a food blogger. 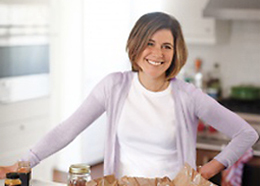 And not just any food blogger — superstar Molly Yeh, who, for a while there, was using so much tahini (in milkshakes, chocolate chip cookies, on glazed chicken ) I thought that maybe she had some investments in the sesame seed sector. Because she’s Molly, she wrote back almost immediately (ahem, @dinneralovestory). She said she pretty much only uses Soom, and I could find it at Whole Foods or Amazon. I followed her marching orders and bought a jar. The first thing I did was make a whipped sweet potato dip (pictured above) that I’d eat on the regs in the 90s thanks to Josie’s on the Upper West Side, where they served it alongside the starter bread basket. (Any other dinosaurs out there remember this?) Since sweet potatoes are one of the few starchy foods that make the cut for Phoebe’s Paleo-ish regimen, I’ve been looking for interesting ways to prepare them, and this one seemed perfect. What I noticed first about Soom’s tahini was the smooth, creamy consistency — there was none of the greasy graininess that I was so used to — and I whirled it into the potatoes with some spices and warm water, then served with a few dipping options (paleo-friendly and otherwise) to snack on before dinner. It had just the right hint of nuttiness — no bitterness, no aftertaste — and went fast. A few days later, I made the spicy tahini dressing from Saladish, drizzled it over baked sweet potatoes, and showered the whole thing with chives. Let’s just say we did not miss the sour cream. I’ve made tahini dressing many times before, but I knew almost instantly that this recipe, with this tahini, was the one forevermore. Now there is always a jar of it in our refrigerator, not only because Phoebe loves it for veggie-dipping, but because it wakes up almost anything on the grill, from chicken to bok choy to kale. As if the news of discovering my go-to tahini was not exciting enough, the nice folks at Soom have decided to offer a free Soom two-pack (a jar of Sesame Premium Tahini, a jar of Chocolate Sweet Tahini Halva Spread) and a Soom onesie (size 6-12 months) to one lucky DALS reader. Comment below before noon (ET) on Monday, June 18 to be eligible. (Special attention paid to tahini-related comments!) Thanks Soom! Thanks Molly! Have a great weekend, everybody. Update: The winner has been notified. Congrats Anu! Combine the tahini, lemon zest and juice, garlic, if using, and water in the bowl of a food processor or in a blender and process to combine. Check the consistency—it should be thin enough to toss with leaves or drizzle on top of potatoes; add another tablespoon or two of water if needed. Add the harissa and salt and process until smooth. The dressing keeps for several days in a covered container in the refrigerator. Blend everything together in a food processor (I use a mini food processor), adding water one tablespoon at a time until it reaches desired consistency. P.S. Molly’s TV show, Girl Meets Farm premieres on the Food Network on June 24, 11 am ET/ 10 am CT/ 11 am PT. Looking for tahini baking ideas? Try Chocolate-Tahini Brownies from Bon Appetit; Carrot Tahini Muffins from Smitten Kitchen; Maple Tahini Cupcakes from Molly; Tahini Cookies from Uri Scheft. Oh goodness. I’ve never used tahini, so I don’t have a go-to recipe. I guess I’d start with hummus! I like to make fresh hummus! I mean, DO you have any dining recommendations for Nashville? I love this recipe, works great with carrots and sweet potatoes too! I’m going to make your sweet potato dip as that looks so good. I like to use tahini in most of my dips – hummus of all kinds mainly. This is so exciting! We always have tahini in the house. I’ve been making up a sauce to use on salad, with falafel, on roasted veg, etc. It is basically tahini, lemon juice, garlic, olive oil, salt, and a little water to loosen it. I just keep it in the fridge all week to liven things up. I recently saw a recipe for tahini fudge so that is next on the list! Wow! I think I live under a rock – Idk that I’ve ever had tahini! And def had no clue it was sesame seeds… which is all great news b/c I’m definitely going to try that dressing asap. After getting very sick when he was two years old, hummus was one of the only things I could get my son to eat. It is still his favourite food and he is now nine. We go through a LOT of hummus! Thanks for the giveaway! Thank-you!!! I thought I was the only person who had trouble with Tahini. I love sesame seeds/oil, but every attempt at homemade babaganoush had a weird after taste. Eggplants will be in season at my CSA soon and I can’t wait to try again using Soom! I love tahini and I know I will love THIS tahini because it is in a screw top jar. The last time I tried to open the can of tahini I purchased, the can opener would not easily open the can and it was not a pretty sight. Plus the tahini within was so hard and crusty and difficult to mix. This one looks delicious and spreadable! we made a chicken sharwama-ish / sheet pan dinner thing with carrots and onions and a tahini lemon dressing quite a bit this past winter! Easy and family friendly! Another great tahini inspired recipe from Smitten Kitchen: https://smittenkitchen.com/2013/10/miso-sweet-potato-and-broccoli-bowl/ It’s a week night go to in our house! Love this! Safe to say that Molly Yeh’s tahini chocolate chip cookies are our house cookie now. My husband makes a delicious sweet potato burger with tahini, white beans, a sweet potato, chipotle seasoning, garlic powder, finely diced white onion–all mixed up and formed into patties–and Panko crumbs for a crispy “burger exterior.” We serve it with sliced avocado, greens, and tomato, and I like a nice squirt of dijon mustard on mine! I’ll give Soom a try. I do hate the graininess of some tahini. Thanks for the rec! That sounds so delicious! I’m going to try that out this weekend! That burger sounds delicious! Googling similar recipes now. How cute is a Soom Onesie! I was googling meal prep ideas the other day and I found a recipe for a sweet potato grain bowl with Green Tahini sauce. I didn’t have tahini so used some sesame oil in the dressing. Would love to try it with the real thing and compare. The chocolate Tahini is intriguing too, should I be thinking Nutella replacement?!?! Thanks Jenny and Soom! I always like to keep a jar of tahini in the fridge, and keep wanting to try Soom, so what a nice confluence of events! I love swirling tahini into a batch of brownies, adding a dollop to miso dressing (so good with roasted beets and carrots! ), etc., etc. The possibilities are endless! 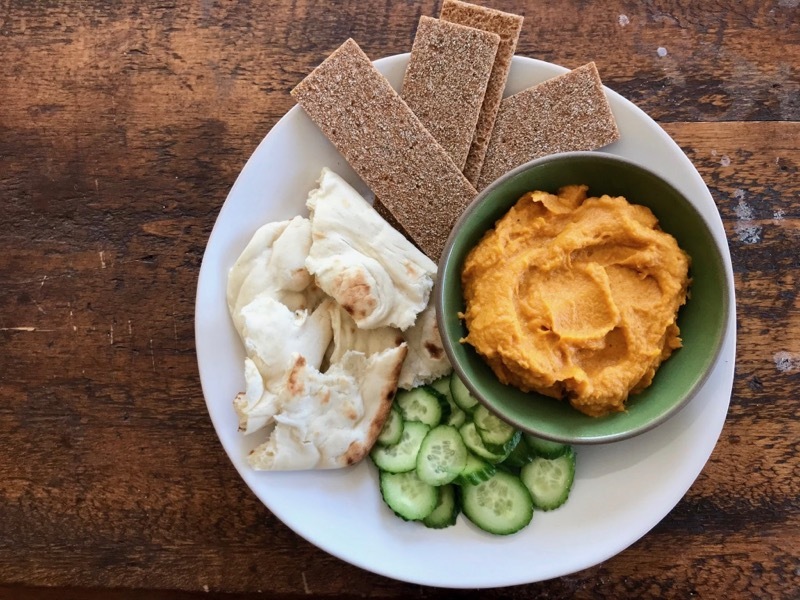 I’d love to try the sweet potato dip you have listed above or even just homemade humus (I’ve tried in the past and just never loved it because of the tahini). I also use it for Ottolenghi’s Butternut Squash with Zaatar & Tahini. It’s one of my go-to autumn dishes and is always a knock-out when I host dinner parties. I’d love to try Soom. Thanks for hosting the contest! One of my fav go to recipes has tahini and lemon! Ooh, this is great! I’ve been making Ottolenghi’s tahini and halva brownies and was overwhelmed in deciding what tahini to use. It seems like a make or break thing to me! I’d love to get to try soom brand! I’ve been using Soom exclusively now for 3 years. Nothing compares. In addition to it being delicious and just the right texture and consistency, I love that Soom is a women owned business. These ladies have it going on!! I love Soom tahini! I learned about it Michael Solomonov’s excellent book, Zahav, and have become a devotee to this brand. One of the best dishes I’ve ever had was roasted vegetables with a tahini lemon sauce at a party. I too have never been able to figure tahini out! My attempts at tahini recipes have never been that great. Now, I am inspired to try the spicy tahini dressing for Father’s Day! I have Molly on the Range but haven’t tried any of her recipes with tahini because I haven’t been thinking ahead when I go to the store. I really want to try her Sesame Coffee Cake! This is so timely! I’m nursing a new baby and have had to lay off the dairy (and soy! It’s everywhere!!) temporarily as it was causing her some tummy trouble. I really love a hummus hack that you wrote about once – stirring in a spoonful of plain yogurt – but with that off the menu for now, it’s tahini (and Paleo-ish) recipes to the rescue! Thanks for the recipes: the Spicy Tahini Dressing sounds really delicious, I will have to try it out. The tahini chocolate chunk cookie (from David Lebovitz’s site) is currently our house favorite. I am actually thinking of making halvah for an upcoming dinner party. I am sure a good tahini will come in handy for this! Soon is the Tahini that Michael Solomonov uses at Zahav in Philadelphia for his hummus. Which is the best hummus I’ve ever had. Recipe is in the Zahav cookbook. I too am a tahini-skeptic! I’ve had so many tahini recipes taunting me for ages (the chocolate chip cookies, the brownies, etc, etc) and I’m excited to try this grilling tip now, too! I have a jar from Trader Joe’s in the pantry that I haven’t opened, but maybe I should just put Soom on the Whole Foods list. This tahini has been added to my Whole Foods list! On my way there as we speak! Josie’s! I miss that place. Definitely making both of these. I’ve been hesitant to buy tahini as well due to all the different brands – even though I’ve been meaning to try all the recipes you mentioned as well as the banana tahini bread on Food52. My partner adores Halva and we have a little one on the way in August, so I had to through my hat into the ring. Thanks, Jenny! Harissa is great spice to pair with tahini! WHAT!? You can use tahini outside of hummus?! This is amazing news. I’d love to try it in a smoothie, or curry or or or or so many interesting uses. Thanks for the recommendation! I’m excited to know what to buy instead of standing for half an hour paralyzed with indecision in the grocery store. Yum! I’ve been locked in a love/hate battle with tahini for years now. It’s always been stir -first peanut butter’s evil stepsister! Totally impossible to blend together in the jar, right? Move over water, oil and sesame paste do not mix. Looking forward to trying this new brand. Thanks for the recommendation Jenny! I always have a jar of tahini in my fridge but I seem to forget about it for months at a time, even though I do like it. I would love to try the Soom! I made Deb Perelman’s miso tahini dressing all the time and my roommate and I cannot keep tahini around – we find a reason to put it on everything! I used to live in Philly and would love to try Soom. I do like to make homemade hummus and I would love to try out a new tahini! Based on your blog posts, I asked my library to order “Saladish”—now it’s in and waiting for me to pick it up! Some Soom tahini to use while trying recipes would be great. I’ve had the same tahini experiences that you describe- I’m on the verge of really liking it but it never seemed quite right to me. Now I will have to try Soom! Chocolate Halva spread sounds amazing. Sweet potato dip is a new one for me! Thank you! This post really speaks to me! I love hummus, and have been unhappy with homemade versions. I’ve even tried peeling the chickpeas! I think the reason I haven’t been happy is because of the tahini, because the batches of hummus I’ve made that I’ve liked the best have been made with no tahini. I will definitely keep an eye out for this brand to see if it helps me perfect my homemade hummus! A bowl of homemade hummus with whatever veggies are ripe in the garden is one of our go-to summer dinners, so tahini is a staple around here. I’ve also tried the David Lebovitz tahini chocolate chip cookies and had a hard time recognizing a flavor difference. Would love to try again with a better quality version! I fell in love with tahini when I was traveling in the Middle East but none in the US tasted right. I just started following Molly Yeh about a month ago and saw her post on tahini milkshakes and Soom Tahini and it’s been on my list to order!! Those milkshakes are on my list of “must try” treats for my upcoming vacation. What a great post and giveaway – I’m definitely going to try this brand! I too have been stumped on my tahini shopping. I love the Ina Garten hummus – lots of lemon and garlic! I’ll pick up this brand soon! Tahini-soy sauce on lettuce wraps is a revelation! I love me some tahini! I’ve even tried it in a smoothie! Soom is a Philly area local! My go-to recipe with tahini is a Smitten Kitchen salad with butternut squash, garbanzo beans & a tahini dressing. I always feel like my tahini goes rancid as soon as I open it, so I’d love to try another brand & see if I have better luck – plus I’m pregnant & due any day so I could put that onesie to good use soon! We love tahini, but have never tried Soom. Love it in hummus, salad dressing, dips, cookies…such good stuff! I love tahini in salad dressing! I have recently begun eating Paleo and had not thought of a sweet potato dip. I will be making it tonight. Now that I am considering it, I think tahini and sweet potato will be a great combination, but it had never occurred to me before. Thanks! I had somewhat similar feelings about tahini so much so that I stopped using it all together! My hummus didn’t suffer much but I just couldn’t get on board with any of the delicious looking dressings out there where tahini was the star. I would love a reason to reconsider my decision to go tahini free in my house. Thanks! A trip to Whole Foods to get the Soom Tahini and the sweet potato dip is on my weekend schedule! Ah, I love tahini! the best recipe I’ve made recently; tahini chocolate chip cookies with sea salt. I bet they would be incredible with Soom (but not Paleo ;)). I would love to get “Soomed”!! If I feel I’m not eating enough raw veggies, then I make a batch of tahini dressing, which guarantees I’ll eat my weight in carrot pounds. I eyeball a scoop of tahini, splash of cider vinegar, garlic, salt, tamari, lemon juice, and olive oil. I give it a whirl in the food processor and am happy. I love the combination of tahini and sweet potatoes. A delicious and super-satisfying bowl can be made of kale (either massaged with lemon and olive oil or roasted), quinoa, roasted sweet potatoes, and a drizzle of tahini. Feels virtuous, but also tastes great and keeps me full. I cook with tahini a good bit but would love to upgrade my recipes with a better tahini! Thanks for the recommendation. Tahini is my jam- I especially like it with pomegranate molasses on crackers in a weird sort of pb&j. I’ve never tried Soom- I normally hold out for imported brands at Middle Eastern grocery stores that are the appropriately liquid, non-clumpy, boring beige that tastes just right. But I would love to try Soom- everyone seems to swear on it. In addition to tahina sauce on everything and tahini in various hummus dishes (especially beet hummus) I love Molly Yeh’s tahina chocolate cake and tahina frosting, which took Algeria by storm when I lived there. I love to make homemade hummus – was actually thinking about it today. Sometimes I’ll make it and we’ll have “hummus day” at work with all the fixins – pita, tomato, onion, cucumber. Would love to try Soom! When I am feeding my daughter ‘s family, ( every Friday) , I have three people who can’t do dairy, two gluten free, and all good eaters. I need to remember to try tahini — there’s some in the frig– to make things creamy. I will put Soom’s on the grocery list. Thanks. Great Recipe! I’ve only used Tahini to make hummus, so this will be exciting to try. Soom IS THE best! I’ve been making lemon tahini dressing and lately have started stirring tahini into my morning oatmeal (special bonus points for stone fruit season ahead: I’ll be doing oatmeal + coconut milk + puffed millet + tahini + chopped fresh peaches + a little brown sugar!). Ooh! I’ve been searching for Soom tahini ever since I saw that Molly Yeh recommended it … alas, our local WF doesn’t carry it. We’d love to try it as we make salad dressings and cook our way through the Ottolenghi/Goh Sweet cookbook (which inspires tahini in everything :)). I do like making different types of homemade hummus, but I have to say I haven’t found a tahini that I love. I will give this one a try. Thanks for the recipe and the give away! I’d love to introduce tahini to my 1 yr old’s taste buds. Love how tahini works with both sweet and savory options! Soon is one of the brands I haven’t tried yet. I would love to give it a go! I have an elderly can of tahini in my refrigerator….an inch of oil on top of a thick sludge. A brand you would recognize. In order to make hummus, I have to pry out a chunk of the paste (always spilling the oil! bleh) and blend it in a food processor to get it to be usable. Soom sounds great! Would love to try it. The sweet potato dip sounds like lunch to me! I do this SAME thing! I am going to try this ! I would love to try this! Thanks for the good looking recipes. I have a great sesame sauce recipe that has tahini as an ingredient and it’s so good, I love to use it over spaghetti squash stir fry with chicken and veggies. My two favorite things to make with tahini are the tahini chocolate chip cookies on Molly’s site (best chocolate chip cookies ever, seriously—everyone agrees) and tahini lemon dressing to eat with baby greens. I’ve never tried soom before and would love to try some before taking the plunge and ordering online! My friend in Cape Town makes a very similar dip (varying the amount of water) to the Saladish dressing (the main difference is no harissa), and it has also become my go-to dipping sauce for roast chicken or veggies! I have been looking for a good Sasame Tahiti. Thanks for the story. I will buy Soom., soon. I love hummus. I will try Soom the next time I make it. Oh thank you for finding this Soom tahini, as I was about to just give up with ever finding a good one. I have had to eliminate most dairy due to GI issues, and a good tahini to substitute for that creamy factor in recipes will make life easier! I just got Molly’s cookbook for my birthday and am halfway through reading it cover to cover! I am searching out this tahini this weekend! I’ve struggled with purchasing tahini in the past, to the extent that I gave up on making hummus for a while — how long can I keep it in the refrigerator? Is it supposed to separate like this? Is it supposed to harden like this? How do I know if my tahini has gone bad? My brother and I exchanged extensive emails about this one summer, after enjoying his creamy hummus on our family beach trip. (“Use your immersion blender in the tahini jar when you first buy it…,” he advised.) (Was he trying to get me to have a mess of tahini all over my kitchen????) I love the screw-top idea from Soom!!! Throwing away the hardened jar of tahini on the bottom of my refrigerator door right now!! 🙂 THANKS for the giveaway and recommendation! I’ve been using and buying tahini for over 30 years and can’t imagine my kitchen without it. We go through it like crazy. 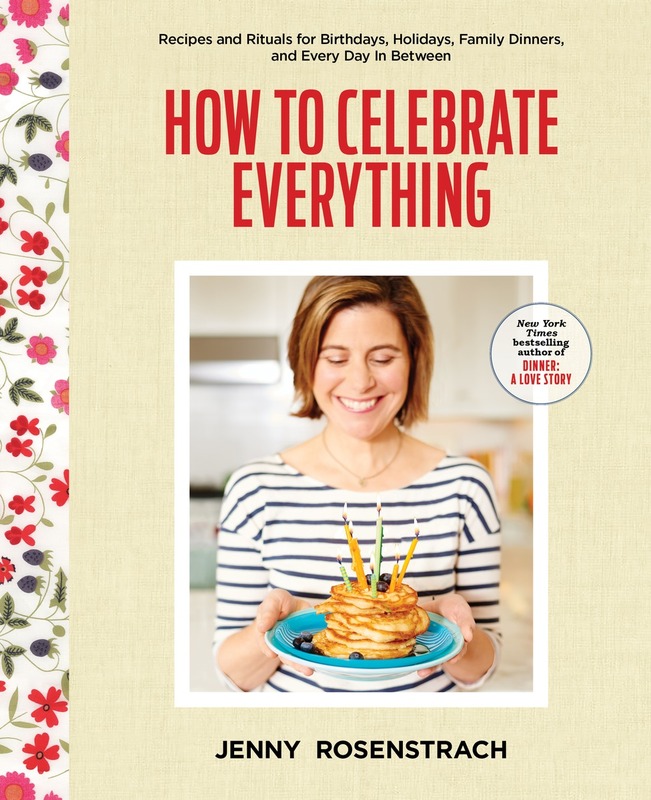 (Do you have Adeena Sussman’s Tahini Shortstack? O-M-G!!) I use Barron’s Tahini, imported from Israel, and it’s as pure and delicious as anything out there. I haven’t tried Soom, but am intrigued now and will have to order some up. Oh, and did you know that you don’t have to refrigerate tahini? I never have; it lives in my pantry and stays fresh for a very long time (although it doesn’t last long in our house). I’ve been told that as the oil separates from the solids and rises to the top, it creates a barrier to keep out bacteria. I just give it a good stir before I use it and then back into the pantry it goes! P.S. Definitely making that sweet potato tahini dip. Wow. Long time, first time….but this one spoke to me, as I have also had a decidedly patchy relationship with tahini. The greasy yet grainy version you mention is unfortunately the only one I’ve come across, despite trying various brands/price points/origins, and I’ve always felt like it’s keeping me from loving this condiment as much as I want to. Plus, I happen to have a 9 1/2 month old baby, Lydia, who I would love to feed her first ever hummus (homemade, of course!) while wearing a teeny tahini onesie-ni! I love tahini and I love halva, but a halva spread sounds downright dangerous! I love the tahini spread for on challah (and it’s really good with apples or carrots, too) from the Modern Jewish cookbook by Leah Koenig. Haven’t tried Soom brand yet, but I will now! I have some forgotten tahini in the cabinet I’ve been meaning to use. These look like a great way to use it up! I only use Soom now, especially after reading Molly’s blog. It isn’t easily available on the West Coast, so thank you Amazon. I make a jalapeño hummus dip with it—delicious! I have a vegan husband, a snack preschooler, and a long tall 4 month old who loves onesies-so this seems like exactly the giveaway for me. If it isn’t rude to refer you to another recipe site, Jenny, my favorite tahini-using recipe is the sauce from the broccoli and sweet potato grain bowls at Smitten Kitchen. It’s anazing. I’ve never tried the Soom brand but heard great things about it. I love tahini — one of my favorites is cucumber, tomato, garbanzo beans etc mixed with a lemon tahini dressing. And with some toasted pita. Great summer dinner. I also have found some tahini too grainy and too thick. I haven’t had very good luck with tahini in the past. Obviously I shouldn’t “throw the baby out with the bathwater” when it comes to all brands of tahini and recipes calling for tahini! This looks great and I’m embarrassed to say that I’ve seen tahini everywhere, but never really understood what it was! Glad there’s an Amazon option to buy it! I just ordered some soom before reading this! Can’t wait to try it in my hummus! It honestly never occurred to me that the brand could make that much of a difference, but you have me convinced to try this! Yes, the difference tahini makes is amazing! I finished the jar I had from an ethnic store, and bought one at the supermarket- the hummus came out totally different. YUM!! I can’t eat dairy and tahini recipes have always intimidated me in the past – excited to try these out! I’m so excited to hear this – last time I bought tahini (for baked falafel, which is one of my favorite summer dishes to make) it was so bitter that it was almost inedible. We ended up eating extra tzatziki instead, so no great loss, but I’d love a reliable, delicious brand! Love Soom and love supporting women-owned businesses! I love that you included the links to other tahini recipes–in the past, it’s been a “purchase for one recipe and languish in the fridge” ingredient, so I’d like to change that! I’ve only used tahini once, doing ~Whole 30~, and we were not impressed. Definitely had the greasy/grainy factors going on. Would love to try it again since the internet is covered with it. Fun! With a brand new babe in the house, I’m doing a lot more armchair cooking (while pinned to the couch nursing) than actual cooking right now. So, homemade hummus, not yet. But a simple dressing to dip veggies into one-handed, that I can do! I love harissa any which way, so that Saladish recipe sounds like a winner. I am so excited to find this tahini, i like it already, but the thought of grainyness free sounds dreamy. I even have a baby for the onesie haha. I’ve been making a sesame-almond cookie that is reminiscent of a snickerdoodle in texture and size. We also love this: https://smittenkitchen.com/2013/10/miso-sweet-potato-and-broccoli-bowl/ We roast all kids of veggies and sometimes add a fried egg. Sometimes I make the dressing and thin it with water. It’s good with all veggies, but I particularly like it with carrots. Oh, and somebody has a recipe for tahini banana bread: so good! I’m looking forward to trying Soom. I haven’t found a tahini I love yet. Love Soom tahini! Learned about it from the Zahav cookbook. I’ve used it to make hummus, a lemon-tahini dressing and the Smitten Kitchen miso, sweet potato and broccoli bowl. I make my friend Shilpa’s zingy hummus, with extra lemon and plenty of chopped parsley for a kind of tabbouli meets hummus flair. Love sweet potatoes and tahini separately, but I’ve never had them together. Can’t wait to try! What fabulous timing! I just read about subbing in tahnini for Mayo on burgers (was it here? ), but was less than enthusiastic about trying it due to my past tahini purchases. But with your recommendation I may just base my entry in our burger cook-off (defending champ here!) around Soom tahini! Thanks! Tahini cookies (I’m imagining black sesame seeds sprinkled on top of them)! Sounds delicious! I’ve made a few things with tahini but was put off my the consistency. Would love to try this. I’d love to try the chocolate SO tahini spread and both tahini recipes from this post. Thanks so much for doing this giveaway! 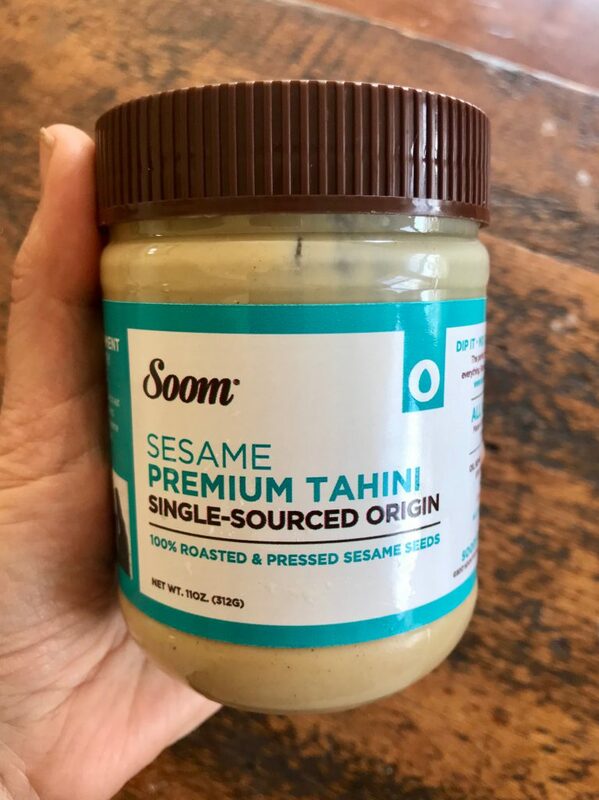 I too have struggled to find a tahini that I love, will definitely check out Soom, thanks!!! I used to go to a Mediterranean restaurant that had an amazing roasted white fish with tahini sauce and pine nuts; I’ve never come across anything like it anywhere else, and would love to find the recipe someday. Oh, I definitely need to try that chocolate halva spread!!! I fell in love with halva on a recent trip to Israel. Oh my gosh- I have so many tahini recipes bookmarked and I think I need to go out and get some Soom to try them out! I have a feeling my life will be changed forever!! I use tahini to make a salad dressing/sauce for grilled chicken. I use tahini to make a salad dressing/sauce for grilled chicken. It says “summer” to me! We use tahini every week for hummus. I love making homemade hummus. Also, use it in salad dressings. I like to use tahini in smoothies (similar to using a nut butter) pairs well with banana and dates. I have a great salad dressing recipe that uses tahini. But I’m going to try that Sweet Potato Tahini Dip posthaste! Huh. I have never actually purchased tahini before. I’ve used some my mother-in-law bought, but only to make hummus. I feel I haven’t adequately explored its potential. My favorite surprising way to use tahini is in a green smoothie recipe I found on the Nutrition Stripped blog – so good! I will sometimes omit the Nutritional Yeast and it is still delicious. We love dipping steamed artichoke leaves and hearts in this dressing, using it as a dipping sauce. My 9 and 5 year old will consume spoonfuls of it this way. I bought a jar of the Soom tahini after I saw somewhere that Zahav’s chef also recommends this brand. I haven’t opened it yet because I’m waiting to use up the jar I already have. Can’t wait to try it. I love tahini, especially making a quick lemon tahini sauce for grain bowls / salads. I usually buy the Trader Joe’s brand, but would love to try a different one! Molly has a recipe for sesame sauce that I put on *everything*–tahini, soy, honey, garlic, chili flakes, sesame oil. SO GOOD. And I’ve been meaning to try those tahini brownies for a while now. Might do it even if I don’t win this giveaway,..
As someone moving to a vegan diet with a 3 month old, it feels like this giveaway was made for me! Here’s hoping I win! i read this eagerly because i too have struggled with the desire to incorporate tahini into my morning smoothie and other things like baked goods that would normally use almond butter but have been put off by the aftertaste. my morning smoothie would benefit from this twist, and now that my husband is eating keto (translation: we’re going through LOTS of peanut butter), i’d like to see what he’d think of using it for dressings (because we’re eating lots more salad too). thanks for the chance to win and for the info. 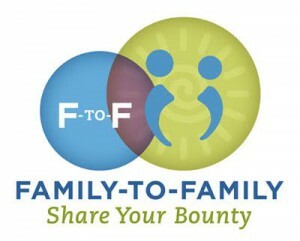 if i don’t win, i’ll be trekking to WF this week…but i hope i win! Thank you – I would love to win. My husband has declared cucumbers dipped in tahini sauce to be the best thing! So I am going to test out several recipes to try to make him a dipping sauce. Yes Please! I have been on the hunt for the perfect Tahini and heard about Soom on another food blog when searching for a perfect hummus technique. I have been putting homemade tahini sauce similar to your recipe on everything including noodles and eggs. Just bought another brand but the jar is sure to run out quickly. I love tahini. Will try to get the Soom soon! Oh wow! My tahini journey has been very similar to yours so far — I can’t wait to try this one! I’ve only ever used tahini in a can. And I stopped making hummus once I tried Sabra hummus – I love that smooth consistency. But that sweet potato spread sounds divine! We also love tahini, though I haven’t tried Soom. In addition to using it in hummus and dressings, we love it mixed with pekmez, a Turkish grape molasses that I bring back from trips to Turkey (or honey, when our pekmez supply runs out), and spread on toast. I do like tahini but I forget about it. Only the ubiquitous canned variety is available in the grocery store here. This looks really interesting. I’m glad I’m not alone in the “I’m I the only one who doesn’t get the tahini love affair?” I have wanted to love it but haven’t found one that does if for me yet. I’ll have to give Soom a try. Definitely going to try the sweet potato dip! I want to try the sweet potato tahini dip! I love making hummus!! I have yet to try this brand of tahini, but will definitely look for it next time I am in need! Would love to win!! Tahini is a wonderful brand. i know about it by accident and it never make me disappointed. I make a similar dressing, minus the harissa. I use garlic powder instead of fresh so the flavor isn’t as overpowering. I serve it as a dipping sauce for steamed string beans or broccoli. Its fab.